Interview with Zahava Founder Jessica Hendricks Yee — Nourish Co.
Last year, a Jewish friend introduced me to Zahava— the gorgeous jewelry and heirlooms line by Jessica Hendricks Yee. Upon first glance, I was already in love and not just with the beautifully designed objects in the shop. There were photos of generations of women gathered around a Shabbat table. On the blog, I found stories and treasured photos from weddings, where couples had thoughtfully blended two heritages, honoring traditions and creating new ones that were just as resonant. I found myself teary, feeling so grateful and excited that there was someone else out there who loved honoring traditions, spirituality, and blending heritages as much as I do. Tell me a bit about your background. I was born in Paris and grew up outside of Manhattan with eyes glued to the cases in my mother’s jewelry shop. I studied Theater at NYU Tisch and then traveled to South East Asia to teach English which inspired me to launch my first line, The Brave Collection. Tell me about your company. How did you come up with the idea? Zahava is a line of jewelry and ritual objects designed to celebrate moments in time. The collection was inspired by the process of planning my wedding. 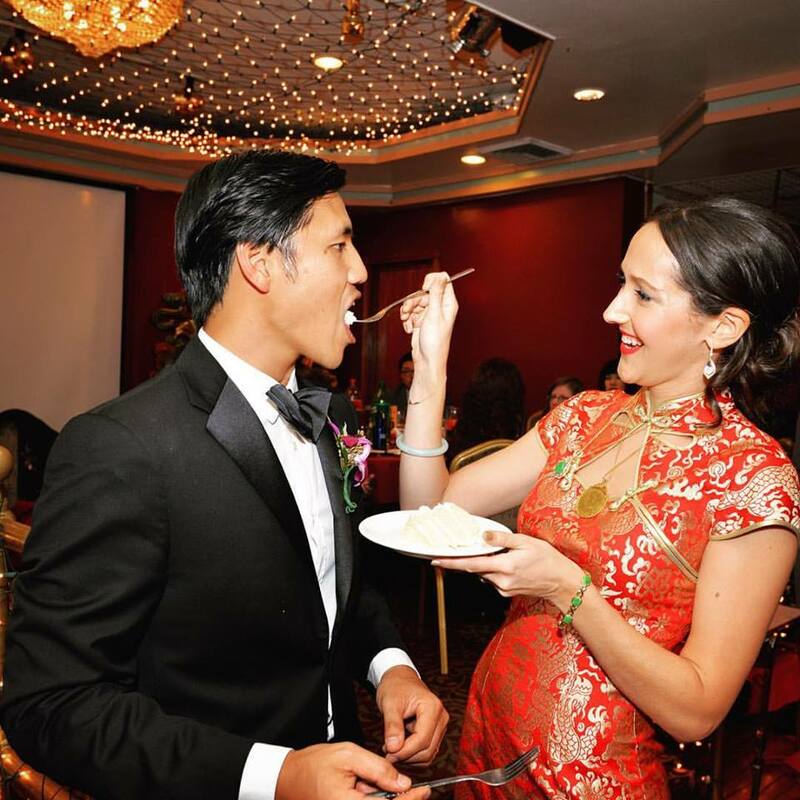 I'm Jewish and my husband is Chinese American, so combining our rituals and traditions into this milestone moment was a feast of symbolism. Throughout the process I thought a lot about the beauty and challenge of celebrating the beliefs and customs of each of our pasts’ ancient, while embracing the modern, multicultural identity as a couple today. What is your company’s purpose? The purpose is to create meaningful pieces that connect you back to an idea, a belief or a wisdom within yourself that you want to be reminded of. To slow down and re-connect to the now. For instance our "If Not Now, When?" ring, reminding you to cease the moment. Or our candelabras— inspired by the ancient ritual of Shabbat, the candelabras were designed to inspire you to put away your phone, even for just a few minutes, and tap into the beauty of the present moment. How do you want people who own a Zahava heirloom to feel when they wear one of your pieces? By infusing objects with meaning, I hope to inspire you to adorn in ideas from the past, connection to the present, and the individual dreams that shape your future. Who is the Zahava woman? Soulful, curious, spiritual— a seeker. How would you describe your spiritual practice? For me spirituality comes in many forms— a beautiful hike, a floral bubble bath with a candle burning, a powerful concert. In terms of my practice, I do TM (Transcendental Meditation) and yoga which I find quite spiritual, take weekly Kabbalah classes, and find a way to honor or celebrate Shabbat each week. What is your earliest, most treasured Jewish memory? I think just the sound of Hebrew chanting and singing in synagogue as a child is my earliest Jewish memory. It was an inexplicable and overwhelming sensory experience— like a vibration that flows through you. I felt connected back to ancestors of the past in the most visceral way. How has your spiritual practice changed as an adult and after getting married? I think I felt a freedom in becoming an adult and a wife to explore what spirituality really meant to me and to begin to create the kind of family traditions I wanted to have. Being the Jewish member of the family also gave me a feeling of responsibility to carry on the traditions and make them beautiful and joyful for my husband to fall in love with them as well. How did your family feel about you marrying outside the Jewish faith? I'm very lucky, my family is incredibly open minded and supportive. My father isn't Jewish so there was no friction there. What has marrying into a Chinese family taught you about cultural traditions and rituals? The Chinese culture in my experience is much more about the group as a whole above the individual— it's a cooperative perspective, which has been really eye opening. Also much like Jewish tradition, it's all about the food! Tell me about your mother-in-law’s dumpling soup for Chinese New Year. She eyeballs everything so I don't have exact measurements but the ingredients for her famous fish dumplings are: Trout, scallions, minced ginger, salt, soy sauce, white pepper, and Chinese cabbage in dumpling skins, served in chicken broth with sesame oil and lots of steamed bok choy. The trick is adding egg or cornstarch to the fish fillings so that they bind together. Many of my friends have expressed frustration over where to purchase beautiful ritual objects. Where are your favorite resources/pieces for the Chinese and/or Jewish home? I couldn't find any ritual objects I liked which is why I started making my own! But I love the Object Enthusiast and Mud for special objects for the home. What are your thoughts on interfaith and interracial marriage as they relate to the future of Judaism? I understand and respect the fear of intermarriage for a small ancient tribe like ours. At the same time, in our modern, global culture it's inevitable, so to punish each other for it will just tear us apart. Instead, I think we have an opportunity to champion and celebrate our culture like never before. What would you like to say to other interracial/interfaith couples? There's no right or wrong except what feels right or wrong to you. It's an incredibly personal process that demands deep self reflection and thoughtful self awareness. It's not for the faint of heart, but the process of understanding who you want to be as an individual and as a couple can be the most beautiful and eye opening journey of your life. What are you most excited about in 2019? Zahava's first full year in business! Who are your spiritual / cultural guides? Rabbi Sharon Brous, The Kabbalah Center, The Sabbath by Joshua Abraham Heschel, the Schusterman Foundation and One Table Shabbat. How do you unplug from the workday/week? Transcendental Meditation, Shabbat, yoga, accupuncture, and cooking at home. What are some off-brand skills or things you love, that not many people know about? Camping! I can pitch a mean tent.